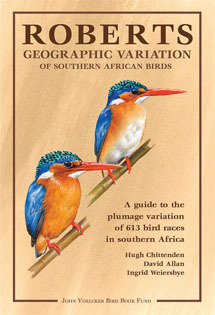 This book illustrates the geographic plumage variation of 613 subspecies of 224 bird species in southern Africa. Hugh Chittenden and David Allan have been working on this book for the last six years, with Ingrid Weiersbye doing the illustrations. There are 105 illustrated plates in a 286 page book. Hugh says that they have managed to cover about 70% of the subspecies, concentrating on those that have differences recognisable in the field. There is a well written introduction, briefly discussing the subspecies concept, the study of subspecies, a brief biography of three important collectors (Roberts, Clancey, Irwin), etc. The introduction includes some colour photos of subspecies, either in the field or museum specimens. The plates are annotated, pointing to the main differences between subspecies. Plumage morphs, eg yellow breasted form of the Crimson-breasted Shrike or the different head colours of the Red-billed Quelea, are not included in this book. Subspecies that show size variation are not listed, unless a particular species also shows geographic plumage variation. The colour maps (courtesy of Guy Upfold) are great, showing the approximate distribution of the different subspecies, using colours to represent the sequence in which subspecies were described historically. Highly commendable is the fact that the source of the paintings is listed, usually a specimen number, sometimes a photo, in an appendix. Also included are the meaning of scientific names of the subspecies. The Southern Masked Weaver is listed with several subspecies (two illustrated), but this species probably shows phenotypic variation and thus should not be included by the authors' own criteria. Male Village Weavers of the nigriceps subspecies are sometimes found far out of range - see news item and follow the links in the news items to read preceding examples. Doubtless future editions will provide corrections and improved information, but this is a great book for birders and ornithologists. Get the book and start looking for the subspecies; try to take photos and submit to the ADU Virtual Museum Birdpix to help collect info on the distribution of plumage variation in our birds!